I found a new website with lighthousephotos worldwide. Last edited by mylights on Sun Nov 13, 2011 3:50 am, edited 1 time in total. Thanks for sharing that link mylights. It could become a very useful resource and it should be given plenty of publicity. A Wiki for lighthouses. Dave, that bridge looks like a railway turntable for ships. 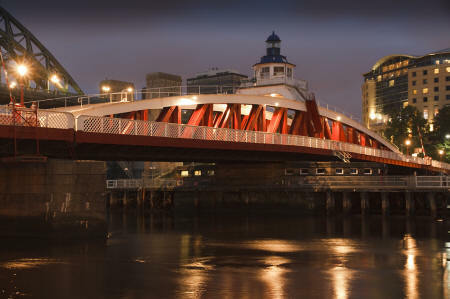 This Bridge is in Newcastle UK. More info can you read on my homepage. It's not sure if the light on top is working. It's not listed. This image from your website shows a fresnel lens in the lantern that appears to be perhaps a 5th order. I have seen this lens too. That's why i have taken this large view picture. Whenn someone know, if the light is still working, please let me know. ...by the way, that lighthouse is AWESOME! The light seems no longer in use and not lighted as apparent from this and several night photos of the swing bridge. The need for this light is now very much less there being significantly more illumination from lights along each side of this waterway than would have existed in 1876 when the bridge began operating. I believe the original plan was for a light at each end of the center pier. Since registration is opened again i would like to say thanks mylights for this topik and welcome everybody at lightphotos.net. We have now 2000+ pictures and this number increases every day. If you have own photos - join to our team, register and upload, that's easy. Collecting photos of lighthouses. If you have some - join! Thanks Mitko. Best wishes to you as well for the festive season. One more year passes away. Best wishes in the new one!